dance 2.0! | Pones Inc.
A performance that examines a typical show from three perspectives: the process, the performance, and the product. 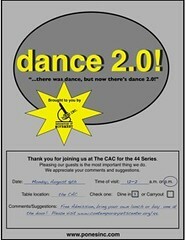 The dancers satirically promote dance 2.0! (the new and improved version of dance as we previously know and accept it) . The result is a sarcastic, yet honest, look at many of the conventions we have come to accept in the world of performance.